Available in Floater or Slow Sink. Tater's Uncle Ronnie Glide bait features a realistic foil finish with his signature mean mouth look and face. The bait is 9 1/2 inches in length and weights about 4.5 oz. It has a very durable rubber tail fin. It has a wide glide with a slow sink rate. LESS THAN 50 HOG FATHER JR's Ever made. 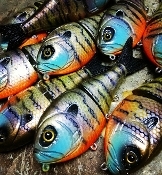 I sold the first 30 at the Bassmaster Classic this past year. 6 1/2 inch 2 oz Slow sinking glide bait Little Angry Gill Floater comes in at 4 1/2 inches and weights 3/4 oz. Walk it over points, flats, brush or next to docks and hold on. Little Angry Gill Floater Tater Hog Moonshiner Wake "Chart Bone"